There’s no question that our line crews who toil during scorching heat and wicked thunderstorms to restore power are the guys and gals in the red capes, the superheroes of CPS Energy. But there are just as many unsung heroes, working behind the scenes and out of the public’s eye, who are critical to our success. Our Financial Services folks are one such group. Apart from the line crews replacing poles, stringing conduit or changing out transformers to ensure reliable service to our customers, the Financial Services team use their keen “super-powers” – math, finance and accounting skills – to ensure that CPS Energy remains financially sound. Their attention to detail, down to the last penny, pays off. “We continue to maintain strong credit ratings from all three major credit agencies, and that benefits us and our customers,” says Linda Dzierzanowski, CPS Energy’s senior director of finance & treasury. 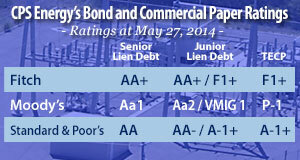 CPS Energy maintains some of the highest credit ratings of any municipally owned utility in the country. As an example, Dzierzanowski said, CPS Energy received a 4.16% interest rate for the issuance of $200 million in new money debt this June – the lowest tax-exempt rate in 50 years. The money will be used to fund upcoming capital projects. Overseeing CPS Energy’s budget is another important responsibility that falls upon the Financial Services team. Have you ever had difficulty managing your personal finances and household budget? Now imagine trying to balance an annual budget in the hundreds of millions of dollars. Financial Services balances our roughly $2 billion annual budget, and provides oversight of $10 billion in company assets. The 105-member team also oversees revenue, and ensures that 14 percent is paid to our owner, the City of San Antonio. These payments totaled more than $317 million in fiscal year 2014 and fund a third of the city’s general fund budget, which pays for basic services such as police and fire protection, streets and infrastructure, parks and youth enrichment programs and libraries. Though they’re balancing budgets rather than balancing on electric poles, the Financial Services team is critical to CPS Energy’s success – because together, We Work for You. Pam is part of the Corporate Communications team at CPS Energy.